If you're inclined to throw a dinner party, you probably do what most folks do: you make a few sides and maybe a salad, ask someone to bring dessert, and put a hunk of meat in the middle of the table, like the roast beast in The Grinch. But what about vegetables? Living in a meat-centric world, most of us simply don't know how to cobble together a series of vegetarian dishes that work together to create a perfect dinner party. Why? Because vegetarian cooking for dinner parties is not part of the American culinary lexicon, until now. Here, critically-acclaimed, food writers (and omnivores) Bruce Weinstein and Mark Scarbrough take the reader by the hand and teach them not only how to make extraordinarily delicious and modern vegetarian and vegan dishes that everyone will love—everything from sweet pea samosas to warm vegan donuts, stews, braises, pastas, and more—they show readers how to actually build dinner parties starting with flavors, seasonality and availability, and even time and skill. Each recipe in Vegetarian Dinner Parties, which can certainly stand on its own, will be complemented by a wine or drink matching, and instructions for how to place the finished dish in the choreography of a 3-course dinner party. 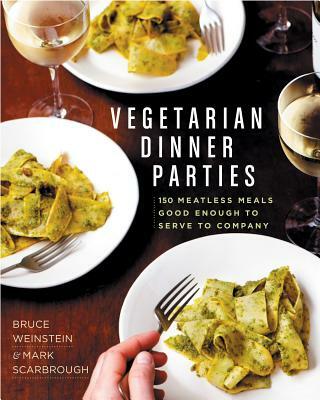 Avid dinner party throwers, BRUCE WEINSTEIN and MARK SCARBROUGH have most recently published Grain Mains (Rodale, 2012). Bruce and Mark are regular contributors to Fine Cooking and Weightwatchers.com, and make regular appearances on radio and television. They live in Colebrook, CT .